The latest major patch for Assassin's Creed Unity will free players from the need to connect the console or PC game to the game's companion app or Initiates website to unlock some special items in the game. "We will be unlocking all content exclusive to Initiates and the Companion App, including both blue and gold chests. Players can still progress on the Companion App, they just will no longer be required to complete content to unlock in-game chests." When Unity launched in November, players had needed to connect to the iOS/Android/(Update: and Windows Phone!) companion app to unlock certain treasure chests that would get them better rewards in the game, including more in-game money and some special outfits for the game's lead character, Arno. Ubisoft had also locked some chests and outfits behind requirements tied to the franchise's Initiates website. But the app and the site never worked as well as intended, with players—and this reviewer—regularly having problems getting either to sync correctly with the game. Since last fall, some players have complained about Ubisoft locking content form its console and PC game from people who didn't want or couldn't even get the Companion App. Not every Xbox, PlayStation or PC gamer has an Android, iOS or Windows Phone device, after all. Without using the app or Initiates website, Unity players would find themselves walking through a virtual Paris littered with treasure chests they couldn't open. That problem was somewhat alleviated the day before Christmas, when Ubisoft took the Initiates site down for maintenance and unlocked all the in-game treasure chests tied to that site. It's not clear how Unity players will now be able to access outfits that had been tied to the App and Initiates, but as soon as we figure that out, I'll update the post. 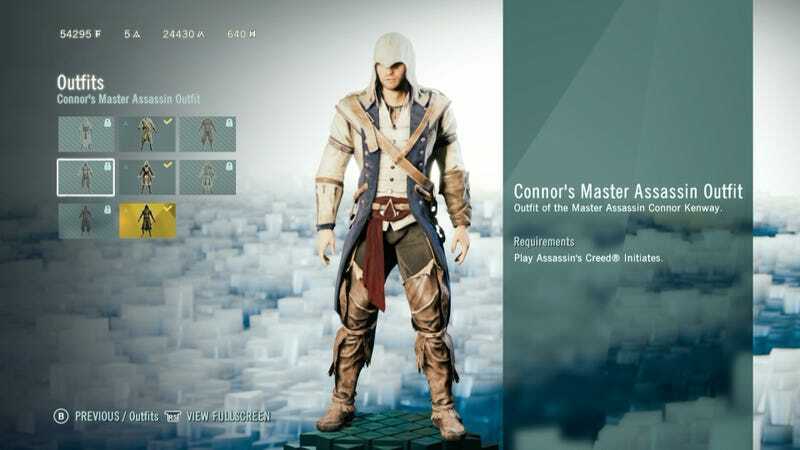 The game's Altair Master Assassin outfit, previously tied to the companion app, can now be obtained by playing Unity's Helix Rifts missions, according to an updated in-game display. Ubisoft says the new patch will also fix the "Find Leon" bug in the game's Dead Kings expansion. That bug bedeviled me when I played Dead Kings for review last month. You can read the full patch notes here. The patch is available now for Xbox One and PS4 today, coming to PC tomorrow. Top shot via Prima Games' AC Unity unlocks page.